“The government of Canada has recently acknowledged the harmful impacts that past government policies and Canada’s colonial history has had on the current status of Indigenous languages, including Inuktut. This is a welcome acknowledgement and a critical part of the process to make meaningful and lasting systemic changes in Canada’s approach to revitalizing, maintaining and promoting our languages. “The International Year of Indigenous Languages is timely for Inuit in that the Government of Canada has committed to co-develop national First Nations, Inuit, and Metis languages legislation. 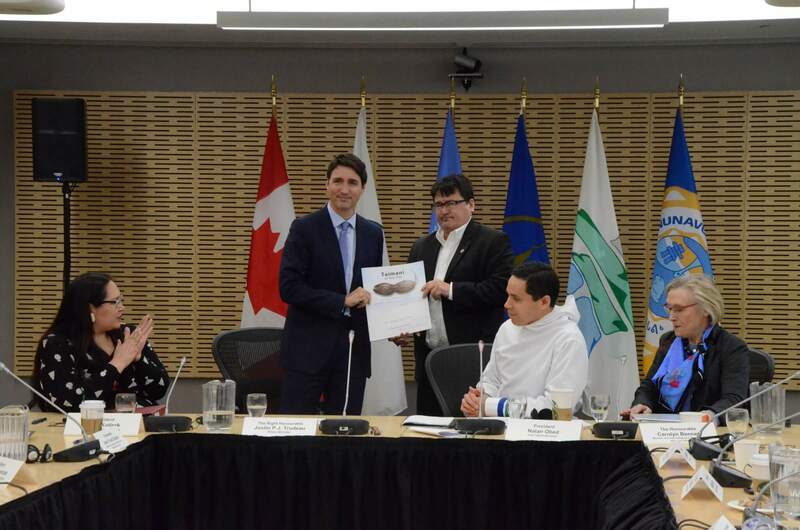 Inuit participation in and support for this legislative initiative has been contingent on the expectation that any bill would be distinctions-based and include substantive Inuktut-specific provisions that build on existing rights for Inuktut. We continue to engage with the Government of Canada in an effort to ensure that the bill meets this expectation. “Inuit in communities across Canada are working together, with support from our Inuit organizations, to keep our language alive and strong. There is so much positive work being done, but we can’t do it alone and we expect governments, and our public services, to respond with strong measures in support of Indigenous languages, beyond symbolic gestures. “As Inuit leaders, we agree that national First Nations, Inuit, and Metis languages legislation must include substantive provisions that adequately support the revitalization, maintenance, and promotion of Inuktut. The International Year of Indigenous Languages provides an opportunity to advance these and other priorities at the national and international levels. “ᒐᕙᒃᑯᖏᑦ ᑲᓇᑕᐅᖏᑉ ᒫᓐᓇᕋᑖᖑᔪᔪᖅ ᖃᐅᔨᒪᓕᕐᓂᕋᔪᒻᒪᑕ ᐊᑲᐅᙱᑦᑐᒥᒃ ᐊᑦᑐᐃᓯᒪᓂᕆᓯᒪᔭᖏᓐᓂᒃ ᒐᕙᒪᒋᔭᐅᖃᑦᑕᕐᓯᒪᔪᑦ ᓯᕗᓂᑦᑎᓐᓂ ᐊᑐᐊᒐᖏᑦ ᐊᒻᒪᓗ ᑲᓇᑕᐅᑉ ᐃᓐᓄᐃᓯᒪᓂᖓᓄᑦ ᐃᒪᓐᓇᐃᒍᑕᐅᓕᕐᓯᒪᓂᖓᓄᑦ ᐅᓪᓗᒥᐅᔪᑦ ᓄᓇᖃᖅᑳᖅᓯᒪᔪᑦ ᐅᖃᐅᓯᖏᓐᓄᑦ, ᐱᖃᑕᐅᓪᓗᓂ ᐃᓄᒃᑐᑦ. ᑖᓐᓇ ᑐᙵᓱᒃᑎᓇᒻᒪᕆᒃᑐᖅ ᖃᐅᔨᒪᓕᕐᓂᕋᖅᓯᒪᓂᖏᑦ ᐊᒻᒪᓗ ᐱᒻᒪᕆᐅᖕᒪ ᐊᓯᔾᔨᐸᓪᓕᐊᓂᐅᒍᑕᐅᓂᐊᕐᑐᓄᑦ ᐊᐅᓚᑦᑎᔾᔪᓯᓄᑦ ᑲᓇᑕᒥ ᐊᑐᓕᕐᑎᑕᐅᒃᑲᓂᕐᓗᑎᒃ, ᐳᐃᒍᖅᑕᐅᖁᓇᒋᑦ ᐊᒻᒪᓗ ᓴᖅᑭᔮᕐᑎᖃᓐᓂᕐᓗᒋᑦ ᐅᖃᐅᓯᓕᕆᔾᔪᑏᑦ. “ᓄᓇᕐᔪᐊᕐᒥ ᐊᕐᕌᒍᖃᖅᑎᑕᐅᓂᖓᓄᑦ ᓄᓇᖃᖅᑳᖅᓯᒪᔪᑦ ᐅᖃᐅᓯᖏᑦ ᓈᖕᒪᓈᖅᐳᑦ ᒐᕙᒪᒃᑯᖏᑦ ᑲᓇᑕᐅᑉ ᐱᓂᐊᕐᓂᕋᕈᑎᖃᖅᓯᒪᓕᕐᒪᑕ ᓴᖅᑮᖃᑎᖃᕈᒪᓪᓗᑎᒃ ᓄᓇᖃᖅᑳᖅᓯᒪᔪᓂᒃ ᐊᓪᓚᓂᒃ, ᐃᓄᖕᓂᒃ, ᐊᒻᒪᓗ ᖃᓪᓗᓈᖓᔪᑦ ᐅᖃᐅᓯᖏᓐᓄᑦ ᒪᓕᒐᕐᒥᒃ. ᐃᓄᐃᑦ ᐱᖃᑕᐅᑎᓪᓗᒋᑦ ᐊᒻᒪᓗ ᐃᑲᔪᖅᑐᐃᒻᒪᑕ ᑖᑦᓱᒥᖓ ᒪᓕᒐᓕᐊᕆᔭᐅᒋᐊᙵᖅᑐᒥᒃ ᐊᑲᐅᓈᕈᑕᐅᒻᒪᑦ ᓂᕆᐅᒋᔭᐅᖃᑦᑕᕐᓯᒪᔪᒧᑦ ᐱᖁᔭᒃᓴᖅ ᑐᙵᕕᖃᕋᔭᕐᓂᖓᓂ ᐊᔾᔨᐅᖏᓐᓂᖓᓄᑦ ᐊᒻᒪᓗ ᐱᒻᒪᕆᐅᖕᒪᑦ ᐃᓄᒃᑐᑦ ᐱᖁᔭᒃᓴᓃᖃᑕᐅᒃᐸᑦ ᐱᕙᓪᓕᐊᓂᖃᕈᑕᐅᖁᓪᓗᒍ ᐱᑕᖃᕇᖅᑐᓄᑦ ᐃᓄᐃᑦ ᐱᔪᓐᓇᐅᑎᖏᓐᓄᑦ. ᒐᕙᒪᒃᑯᖏᑦ ᑲᓇᑕᐅᑉ ᐱᓕᕆᖃᑎᒌᓐᓇᕐᐸᕗᑦ ᐱᖁᔭᒃᓴᖅ ᐱᖃᓯᐅᔾᔨᓯᒪᖁᓪᓗᒍ ᓂᕆᐅᒋᔭᑦᑎᓐᓂᒃ. “ᐃᓄᐃᑦ ᓄᓇᓕᖕᓃᒃᑐᑦ ᑲᓇᑕᓕᒫᕐᒥ ᐱᓕᕆᖃᑎᒌᒻᒪᑕ, ᐃᑲᔪᕐᑕᐅᓪᓗᑎᒃ ᐃᓄᐃᑦ ᑎᒥᖁᑎᖏᓐᓂᒃ, ᐅᖃᐅᓯᖅᐳᑦ ᐳᐃᒍᖅᑕᐅᖁᓇᒍ ᐊᒻᒪᓗ ᐊᑑᑎᖃᖅᑎᑕᒻᒪᕆᐅᖁᓪᓗᒍ. ᐱᐅᔪᒥᒃ ᐱᓕᕆᓪᓗᐊᕐᓯᒪᒻᒪᑕ, ᑭᓯᐊᓂ ᐃᓅᑑᑎᔪᓐᓇᖏᓐᓇᑦᑎᖓ ᐊᒻᒪ ᒐᕙᒪᒋᔭᕗᑦ, ᑭᓇᒃᑯᑐᐃᓐᓇᕐᓄᑦ ᐱᔨᑦᑎᕈᑏᑦ, ᐊᒃᓱᒻᒪᕆᐊᓗᒃ ᐃᑲᔪᕐᑐᐃᖁᒐᓗᐊᕐᐸᕗᑦ ᓄᓇᖃᖅᑳᖅᓯᒪᔪᑦ ᐅᖃᐅᓕᕆᔾᔪᑎᖏᓐᓂᒃ, ᓇᓗᓇᒃᑯᑕᑐᐃᓐᓇᐅᖏᓪᓗᓂ. “ᑕᐃᒪᓐᓇ ᐃᓄᒃᑎᒍᑦ ᓯᕗᓕᕐᑎᐅᓪᓗᑕ, ᐃᓱᒪᖃᑎᒌᒃᐳᒍᑦ ᓄᓇᖃᖅᑳᖅᓯᒪᔪᓄᑦ ᐊᓪᓚᓄᑦ, ᐃᓄᖕᓄᑦ, ᐊᒻᒪᓗ ᖃᓪᓗᓈᖓᔪᓄᑦ ᐅᖃᐅᓯᖏᓐᓄᑦ ᒪᓕᒐᖅ ᐱᖃᓯᐅᔾᔨᓯᒪᔭᕆᐊᖃᖅᐳᖅ ᒪᓕᒐᓐᓂ ᑎᑎᕋᕐᓯᒪᓗᒋᑦ ᓈᖕᒪᒃᑐᒥᒃ ᐃᑲᔪᕐᓯᓂᖃᓪᓗᑎᒃ ᐊᑐᓕᕐᑎᑕᐅᑲᓂᕐᓂᖏᓐᓄᑦ, ᐳᐃᒍᖅᑕᐅᖁᓇᒋᑦ, ᐊᒻᒪᓗ ᓴᖅᑭᔮᕐᑎᑕᐅᓗᑎᒃ ᐃᓄᒃᑐᑦ. ᓄᓇᕐᔪᐊᕐᒥ ᐊᕐᕌᒍᖃᖅᑎᑕᐅᓂᖓᓄᑦ ᓄᓇᖃᖅᑳᖅᓯᒪᔪᑦ ᐅᖃᐅᓯᖏᑦ ᐱᓪᓗᒋᑦ ᐱᕕᖃᕐᕕᐅᕗᖅ ᓯᕗᒧᒋᐊᖅᑎᑕᐅᓗᑎᒃ ᑖᒃᑯᐊ ᐊᒻᒪᓗ ᐊᓯᖏᑦ ᓯᕗᓪᓕᖅᐹᖑᑎᑕ ᑲᓇᑕᓕᒫᕐᒥ ᐊᒻᒪᓗ ᓄᓇᔪᐊᓕᒫᕐᒥ.